Cookiecutter Shark (Isistius brasiliensis) | Better Know a Fish! Last Thursday, I satisfied some serious fish geekery cravings at Nightlife, the fantastic science outreach gala hosted weekly by the California Academy of Sciences in San Francisco. Think couples and singles enjoying wine and cocktails, DJ’s and games inside a world-class science museum, and you get the idea. Cal Academy is famous for its Steinhart Aquarium, home to 38,000-some living specimens, as well as its Department of Ichthyology, which houses roughly 1.2 million specimens representing nearly 11,000 species. Needless to say, it was a thrilling night of fishspotting — with much credit to the museum’s researchers and their dedication to public outreach. Fast forward to Thursday night. 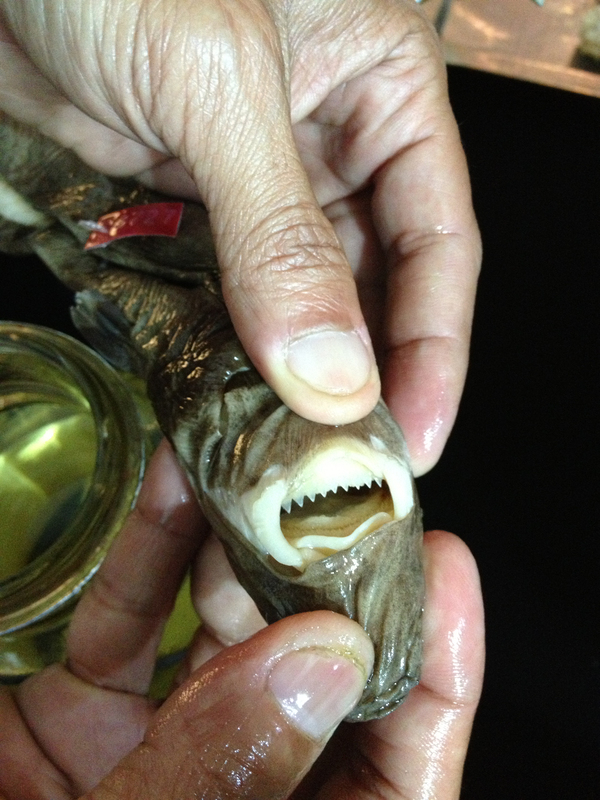 After few sips of sangria and Moscow Mules, my friends and I wandered over to the ichthyology table, where lo and behold, Rocha had a specimen of the cookiecutter shark waiting. Cookiecutter sharks are called such because of their unique mouth and feeding habits. As you can see in the photo above, the mouth of this shark is shaped like a round suction cup, with an upper jaw full of needle-like teeth and the lower jaw equipped with rows of interconnected, saw-blade-like teeth. This frightening combination of dental equipment allows these small sharks — under two feet (60 cm) in length — to feed on and inflict gruesome damage to creatures much larger than itself — even great white sharks (Hoyos-Padilla et al. 2013). There is one documented attack by a cookiecutter shark on a human swimmer (Honebrink et al. 2011). However, the person was attempting a long-distance swim over tropical, open waters at night — the prime feeding zone and feeding time for the cookiecutter. Cookiecutter sharks live in waters below 3,000 feet deep during the day, but at night, they migrate towards the ocean surface to feed. These sharks also have bioluminescent spots on their belly — meaning they can glow in the dark — a common feature on many deep sea creatures. Many thanks to Dr. Rocha for showcasing this unique and strange shark to the public — a species very few of us would be lucky (or unlucky) enough to encounter in person. And a tip of the hat to the California Academy of Sciences for continuing public outreach programs like Nightlife — proving without a doubt that science and learning can be hip and fun — even for grownups. This entry was posted in Chondrichthyes, Marine Fish, Squaliformes and tagged Atlantic Ocean, California Academy of Sciences, cigar shark, cookiecutter shark, Dalatiidae, Indian Ocean, Isistius, Isistius brasiliensis, kitefin sharks, Pacific Ocean, sharks, Squaliformes. Bookmark the permalink. Pingback: Amazon Leaffish (Monocirrhus polyacanthus) | Better Know a Fish! Pingback: Warty Frogfish (Antennarius maculatus) | Better Know a Fish!